This 4th of July bingo game will add some family fun to your Independence Day celebration. Oh no.. thunderstorms roll through in the middle of your 4th of July celebration! What to do to keep the party going?? Play 4th of July bingo and you can download all you need right here for free! It's a little different spin on your traditional bingo. Each player gets a blank Bingo Board and a word bank. Then using the word bank, you fill in your own board. Directions are included too! It fun for all age groups, after all who doesn't love BINGO?? Here's all you need to play 4th of July Bingo! Best of all, it's free..just print and play. What can you do for prizes? Instant lottery tix or how about some fun Light Up Gifts with a 4th of July theme like these? Old and young alike love these fun prizes! Your party will be aglow long before the fireworks start! Here's a 4th July game pack that we have ordered before and really enjoyed. 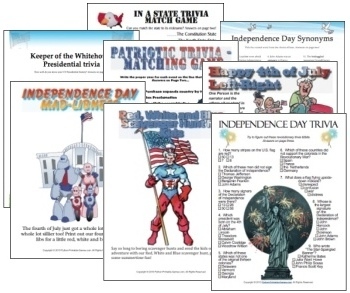 Lots of fun patriotic trivia, word search, madlibs and guessing games.. great for the car if you are traveling to your Independence Day party or fun while the burgers are grilling and PERFECT if your beautiful July 4th party is curtailed by rain and moved indoors! More 4th of July Celebration Ideas for all ages! More 4th of July party ideas.. from festive desserts to crafty decorating ideas, we have them all! See our assortment of 4th of July games and activities! Lots of great ideas to keep your 4th of July party filled with fun and some healthy competition!